Heat oven to 450°F. Spray jelly roll pan, 15 1/2x10 1/2x1 inch, with cooking spray. Toss bell peppers and mushrooms with oil in pan. Bake uncovered 15 to 20 minutes or until crisp-tender. Refrigerate 15 minutes to chill. Coarsely chop roasted vegetables. 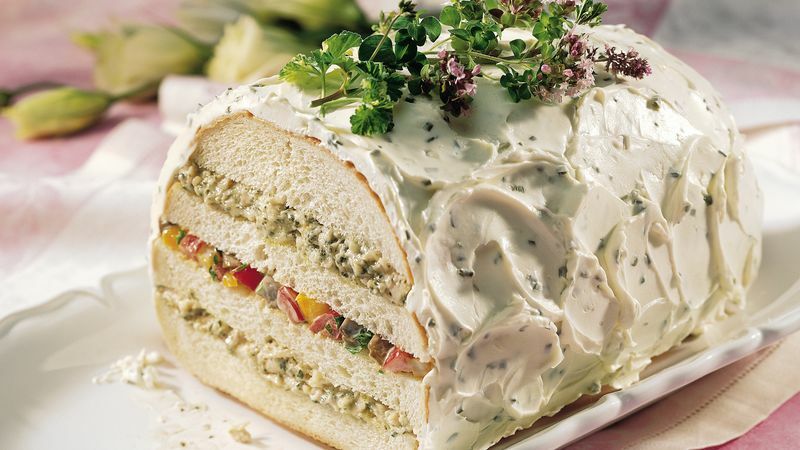 Mix chopped vegetables, parsley and 2 tablespoons mayonnaise; set aside. Mix chicken, 1/2 cup mayonnaise and the pesto. Cut bread horizontally into 4 layers. Place bottom layer on plate or tray. Spread with half of the pesto filling. Top with bread layer. Spoon vegetable filling over bread layer. Top with bread layer. Spread with remaining pesto filling. Top with remaining bread layer. Spread cream cheese over outside of sandwich loaf. Refrigerate at least 1 hour before serving. Garnish loaf with fresh herbs. Cut into 8 slices; cut each slice in half. Store covered in refrigerator. Basil pesto is found in 2 places in most grocery stores. Check the refrigerated pasta case and the pasta sauce aisle. Chopped cooked roast beef instead of the chicken is another option for this oversized sandwich.